Sunshine after rain leads to rainbows. Since I hadn't seen one in a long time (if it ever rains where I live it's gray no matter what), a rainbow puts a smile on my face. Even if it's a partial one that disappears at a different angle like the small one I saw as my Simple Pleasure of the Day. 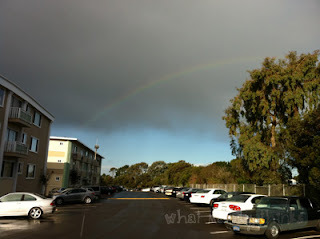 Single rainbow all the way across the sky, yeah so intense. - It just rained so you're probably wet if you've been outside before it made its appearance. Dry off and enjoy the scene indoors. - There's some gay pride or gay people within the vicinity. - There are probably not any pots of gold or tiny men in green outfits running around, contrary to popular belief in story books, so even if you could get to the end of a rainbow it's not going to solve your financial woes. But ohhh boyy do I wish rainbows would come around more often. Since the whole "double rainbow" internet craze, I've been craving a glimpse of those colorful beauties every time it rains. I have yet to witness a double rainbow in person, and I haven't even seen a whole one since high school (so at least seven years ish). Though you could argue that since I've moved to the Bay Area I've seen my share of rainbows. I shouldn't complain haha.